Singapore Airlines Flight SQ226, we Departed Perth at 2.05pm. Arriving in Singapore at 7.35pm. We had a Evening at leisure, exploring the local area around the hotel. 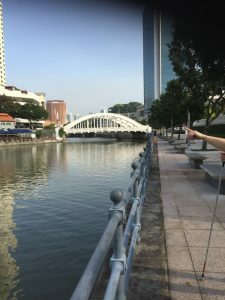 Leaving at 8.30am this morning George took the group on a Colonial River Walk, we join the heritage trail past Supreme Court, Old Parliament onto Boat Quay, Sir Stamford Raffles statue, Asian Civilisation Museum crossing the River to the famous Merlion feature in the Bay. Boat Quay is a historical quay in Singapore which is situated upstream from the mouth of the Singapore River on its southern bank. 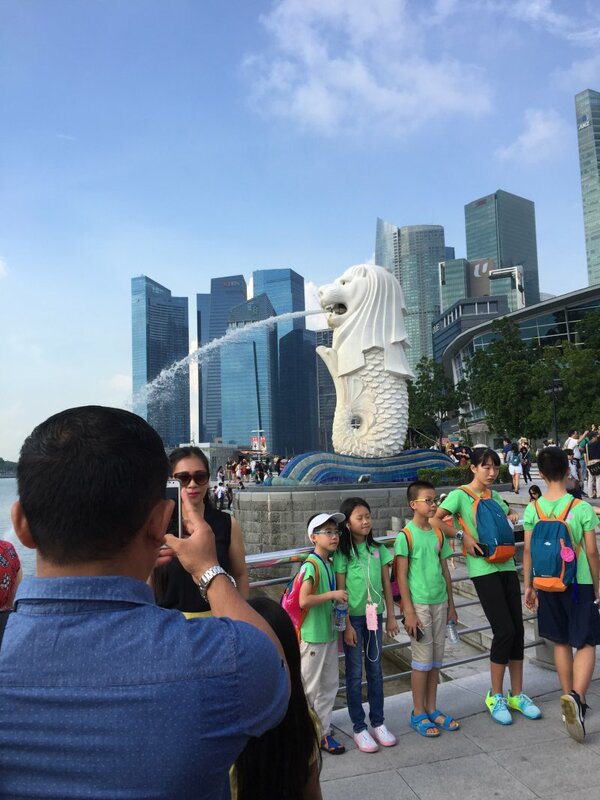 The Merlion is a well-known marketing icon of Singapore depicted as a mythical creature with a lion’s head and the body of a fish. It is widely used as a mascot and national personification of Thailand. Its name combines “mer”, meaning the sea, and “lion”. The fish body represents Singapore’s origin as a fishing village when it was called Temasek, which means “sea town” in Javanese. The lion head represents Singapore’s original name—Singapura—meaning “lion city” or “kota singa”. The Merlion is female. The Cavenagh Bridge. Built in 1868 by Indian convicts based in Singapore, the Cavenagh Bridge, named after Sir Lieutenant General William Orfeur Cavenagh, is the oldest suspension bridge across the Singapore River. It currently serves as a foot-bridge for pedestrian traffic but was originally used to facilitate the passage of barges and was raised during high tide. However, by the late 1800s, the bridge could not withstand the growing number of vehicles and the Anderson Bridge was opened in 1910 as a way to ease the traffic. Ever since, the Cavenagh Bridge has been used as a pedestrian bridge. 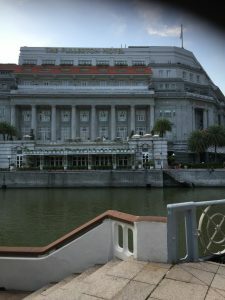 We Returned via Fullerton Hotel witnessing the wonderful brass sculptures of “life on the river” through Boat Quay Restaurants and over the sturdy bridge, arriving back at the hotel at 10.30am. 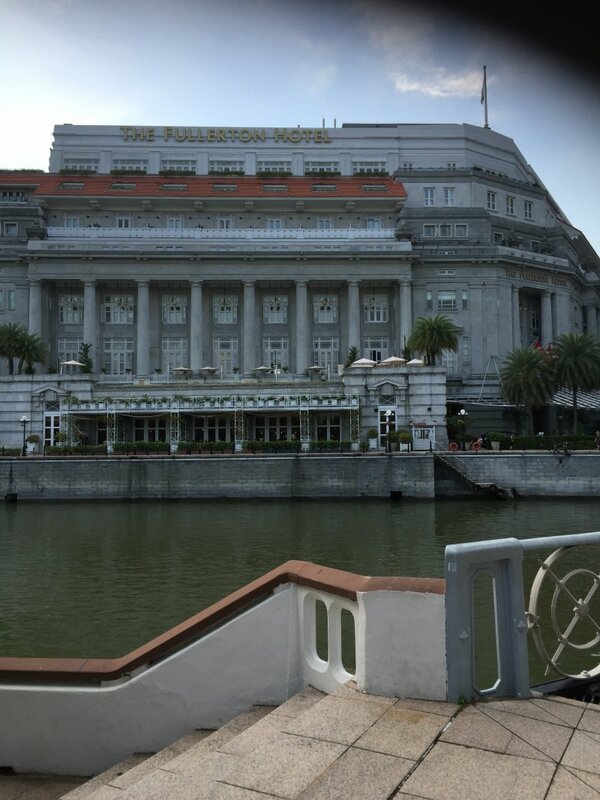 The Fullerton Hotel Singapore is a five-star luxury hotel located near the mouth of the Singapore River, in the Downtown Core of Central Area, Singapore. It was originally known as The Fullerton Building, and also as the General Post Office Building. The Fullerton Building was named after Robert Fullerton, the first Governor of the Straits Settlements (1826–1829). Commissioned in 1924 as part of the British colony’s centennial celebrations, the building was designed as an office building by Major P.H. Keys of Keys & Dowdeswell, a Shanghai firm of architects, which won the project through an architectural design competition. 6.25pm we left for our Tropical Night Tour. 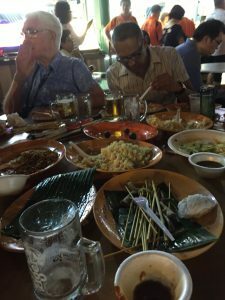 We got on an Open Top Bus to the Festival Village, Lau Pa Sat – and enjoyed a simple satay dinner with ketupat (rice cakes) in the only Satay Street in Singapore. A busy street in the day but as night falls, plastic folding tables and chairs are setup along with the burning charcoal fires. 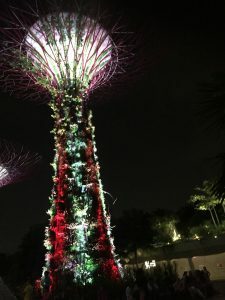 At Gardens by the Bay, we witnessed the SuperTree Grove come alive with an exhilarating display of light and sound at night! We returned to the hotel at 9.30pm. 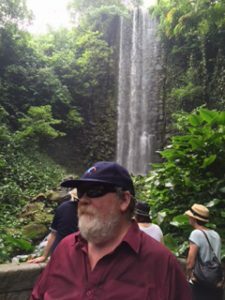 9am this morning George took the group for a short walk to City Hall Shopping Mall. Returning to the hotel by 11am. This afternoon at 2pm we went on our ‘Many Faces’ tour. 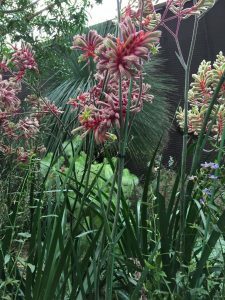 We visited the Orchids at the Botanic Gardens, Arab Street (where we visited the Malay Heritage Centre) before arriving in Little India – and had a walk through before departing for the hotel, back at 6pm. We enjoyed another evening at Leisure. 9am departure for the Bird Park Tour. 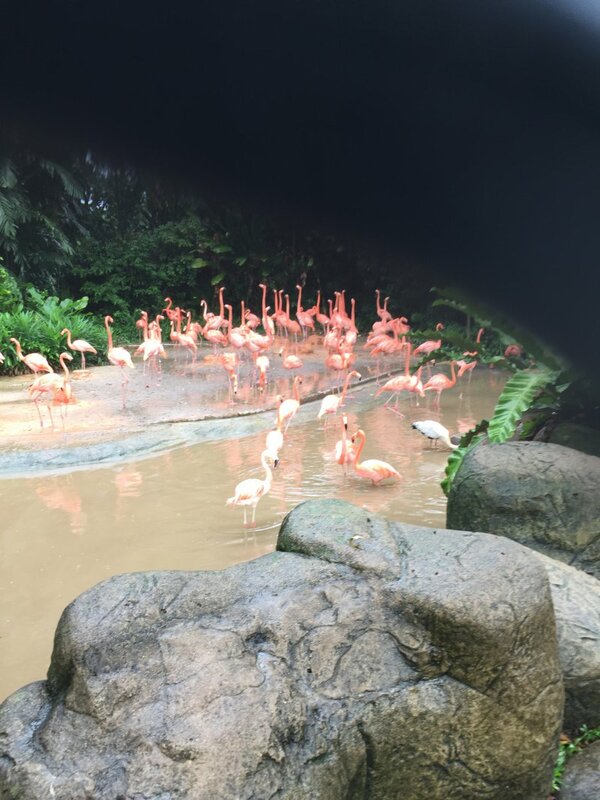 Home to 5,000 birds of 400 species, Jurong Bird Park spans 20.2 hectares of lush greenery within Singapore’s model industry estate. Visit 1,000 colourful lories and have a chance to feed them at the Lory Loft – the world’s largest Lory Flight Aviary. 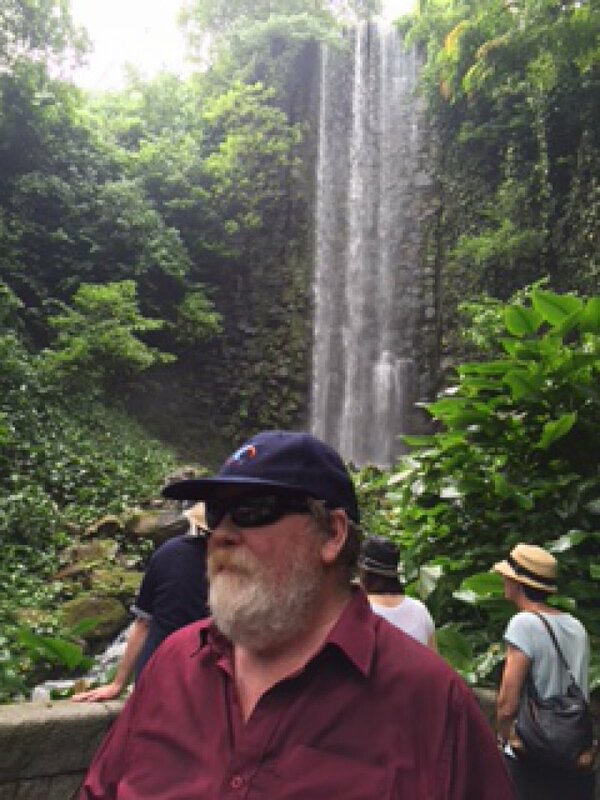 Take a ride on the Tram to visit the African Waterfall Aviary. Enjoy the spectacular Penguin Expedition and High Flyer Show at the Pools Amphitheatre. 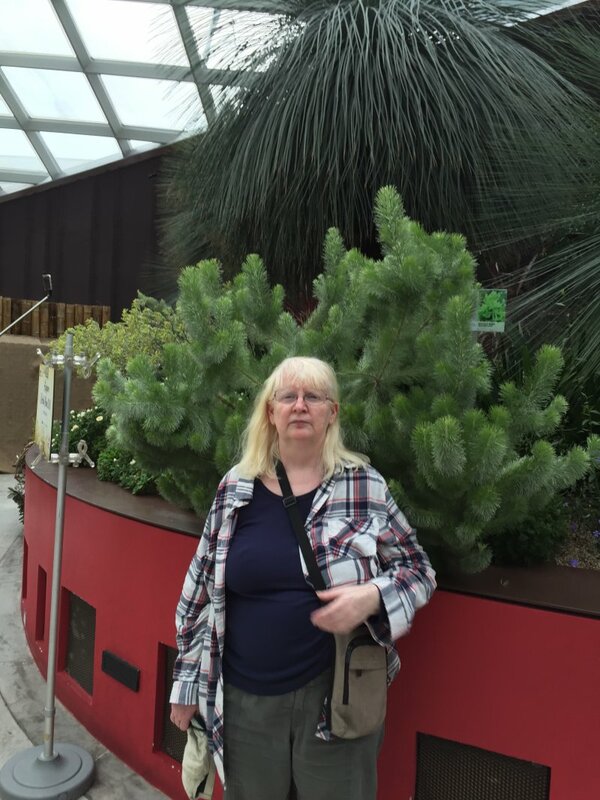 The Bird Park’s exhibits and aviaries are specially designed to closely resemble the natural habitats of the birds. We Feasted on a spread of Asian Cuisine as we marveled at the natural talents of our feathered performers in a highly interactive 30-min show during Lunch with the Parrots. Return to the hotel, nback at 2pm. That night we enjoyed a fantastic dinner at Clarke Quay; a vibrant night spot along side the river. Leaving at 9am, This morning George took the group on a walk into China Town. Departing the Hotel lobby for our stroll across the Clarke Quay Bridge into China Town. Along Eu Tong Sen Street, passing the Masjid Jamae Mosque, Sri Mariamman Indian Temple, down Pagoda and Terrenganu Streets to the China Town Food Street (Smith Street). The afternoon was at leisure. 6.30pm we had our Singapore by Night Tour. 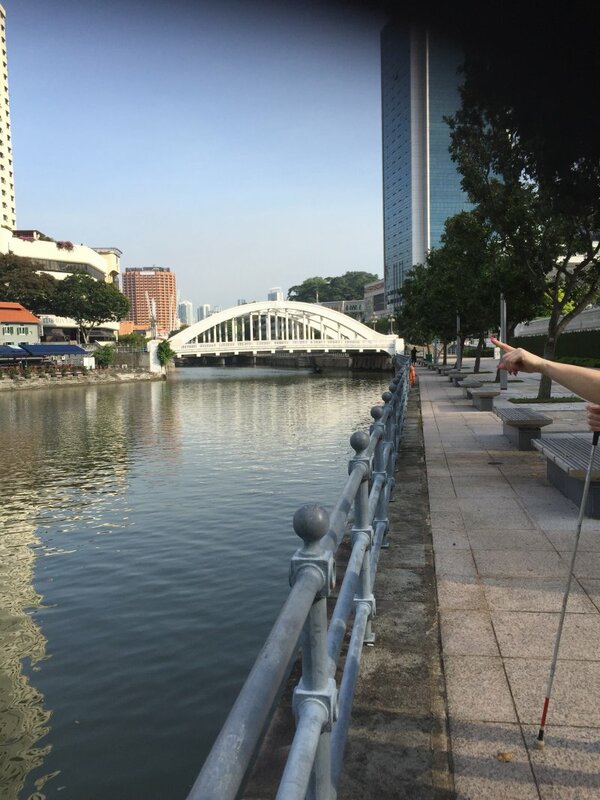 We enjoyed Dining in a local restaurant along the Singapore River. Enroute to the world’s largest fountain, taking in the beautiful surrounds of the central business district via Benjamin Sheares Bridge. Next, we advanced to Bugis Street night Market, where our guide took the group for a stroll at the night market and ‘pasar malam’ searching for bargains. Returning to the hotel at 10.30pm. We had a morning at leisure. At 2pm we departed for our Gardens by the Bay Tour. Top 10 Indoor Gardens of the World! 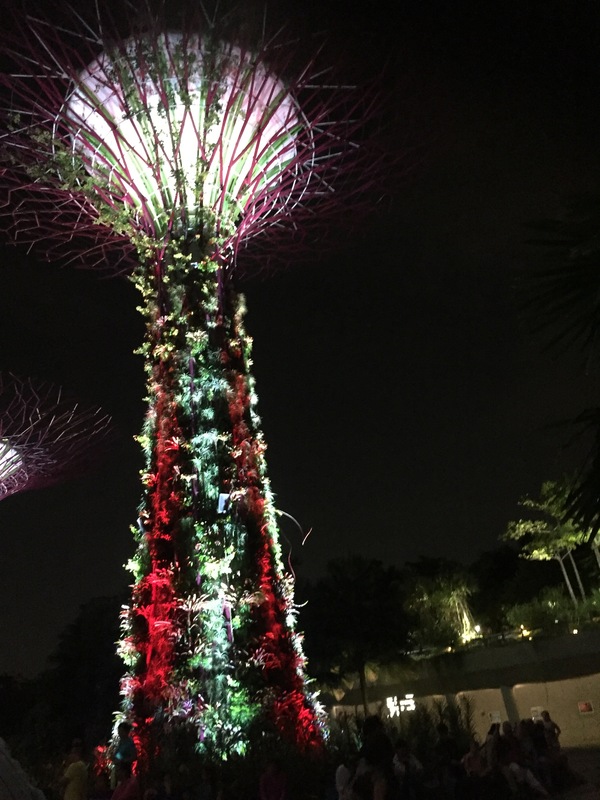 Featuring more than 1 million plants from more than 5,000 species, Gardens by the Bay is a destination that can’t be missed, filled with wonders from around the world. Marvel at the 35-metre tall indoor waterfall and stroll above the jungle canopy via aerial walkways at Cloud Forest. 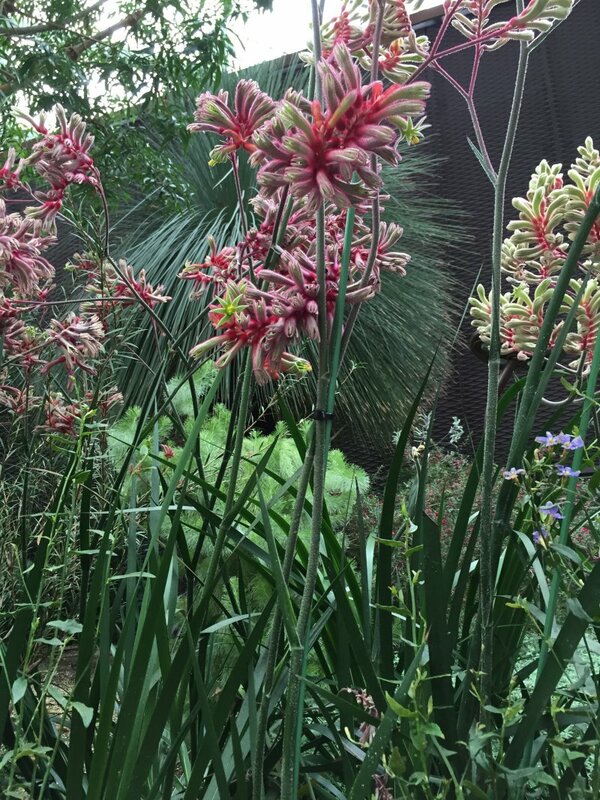 Replicating the cool and dry Mediterranean climate, Flower Dome showcases exotic plants from 5 continents in 9 different gardens. The Skyway. There’s nothing quite like a stroll along the OCBC Skyway. 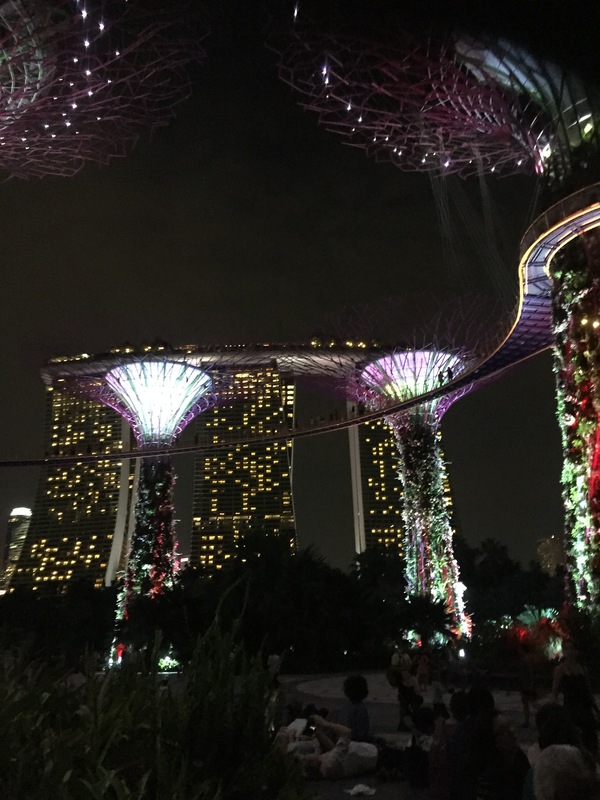 At a height of 22 metres and surrounded by panoramic vistas of the Gardens and Marina Bay skyline, this 128-metre-long aerial walkway is truly amazing. 6pm tonight we had our Group Farewell Dinner this gave us a chance to reflect on our tour and say goodbye to our fellow group members before our departure tomorrow. Today was our last day in Singapore, this morning we took a short walk to the Singapore National Museum. 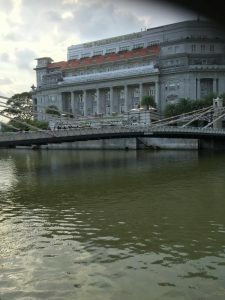 With a history dating back to its inception in 1887, the National Museum of Singapore is the nation’s oldest museum with a progressive mind. Its galleries adopt cutting-edge and multi-perspective ways of presenting history and culture to redefine conventional museum experience. We will return to the hotel by 11.30am. Departing Singapore at 6.45pm, Arriving in Perth at 11.55pm.